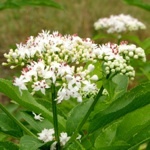 Dwarf elder, Sambucus ebulus, is vigorous perennial weed with attractive divided leaves and small, creamy, white flowers with purple stamens; which are arranged in flat topped clusters above the foliage. The flowers are followed by bunches of deep purple, almost black, juicy berries on stalks which turn red. The plant is widespread throughout Eurasia; it is native to the Greek mainland and has now become naturalised on many islands, including Skopelos, where it grows in fallow fields and on field margins close to the town. 1.Catherine Perlès. The Early Neolithic in Greece: The First Farming Communities in Europe. Cambridge World Archaeology. 2001. 2.Marzie Jabbari. Biological Effects and Clinical Applications of Dwarf Elder (Sambucus ebulus L): A Review.Journal of Evidence-based Complementary & Alternative Medicine. 2017.